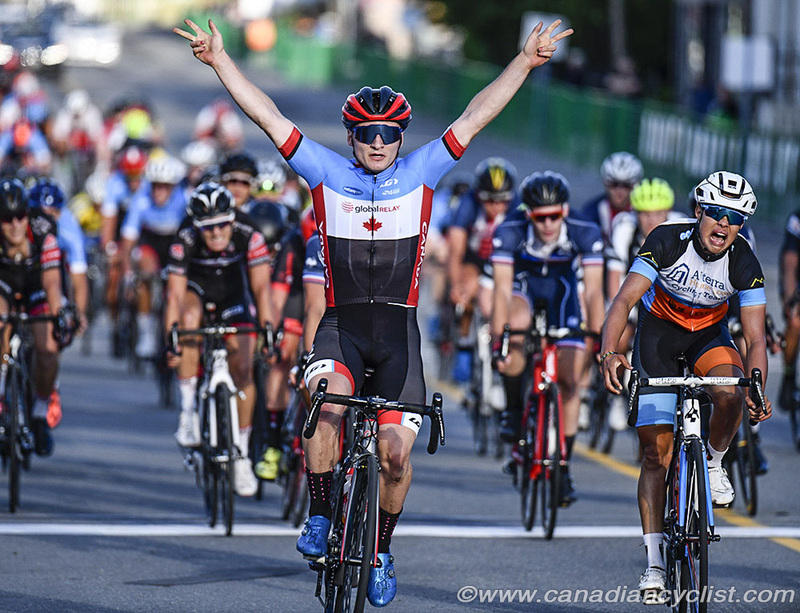 The 50th edition of the Tour de l'Abitibi concluded on Sunday with Team Canada's Riley Pickrell winning his third stage of the seven stage race and taking the Points Jersey for the overall competition. Riley Sheehan led a Team USA sweep of the overall podium, and became only the fourth rider in the history of the event to win both years he raced. Connor Martin (TaG Cycling) was the top Canadian in the overall standings, finishing tenth, and also took the Polka Dot Jersey as the top climber in the race, as well as finishing third in the Best Young Rider category. Team Canada finished fourth in the Teams Classification, which was won by Team USA. The only stop on the UCI Junior men's Nations Cup, Abitibi has seen some legendary cyclists begin their international careers here. Steve Bauer, Alex Stieda and Laurent Jalabert are a few of the riders who have gone on to become successful professional cyclists. 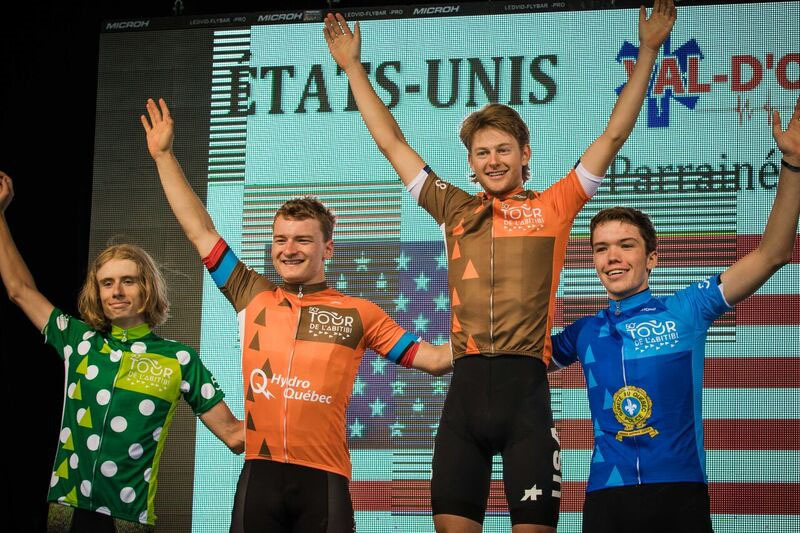 Canadian Criterium champion Pickrell won the opening stage, donning the Brown Jersey of race leader, Orange Jersey of Points leader and Blue Jersey as Best Young Rider (first year Junior). He lost all three jerseys on the following stage due to an unfortunately timed puncture three kilometres from the finish line, but bounced back to finish second on Stage 4 and Stage 6, win Stage 5 and then win the final 120 kilometre stage between Senneterre and the race host town of Val d'Or. "Our team had two goals coming into the final stage," said Pickrell, "move [Team Canada's] Robin Plamondon into top 10 on the GC [Plamondon finished 11th overall, three seconds out of the top-10] and win the last stage. Our team's dual goals meant a lot of work by our other three teammates. They spent the majority of the day around Robin and I, protecting us. Coming into the final laps of the five kilometre circuit, Carson Miles, who developed into an exceptional lead-out man, linked up with me and kept me sheltered from the wind before driving me into prime position for the final sprint. From there I fell into muscle memory and launched my sprint. The final sprint went very well, and the technique was the best of the week. Since I didn't have to fight for wheels coming into the final 250 metres, I was able to relax and focus on the technical skills, just before launching." "Three stage wins is far more than I expected," admitted Pickrell. "The strength of the international field is shocking and to come away with three stage wins is surreal. Abitibi was amazing. It is by far the favourite stage race I've competed in, due to the sportsmanship and fellowship created by hard international racing. I would often be amazed by the speed of the peloton as we flew through the Abitibi countryside." The team was directed by Scott McFarlane of Canadian professional development team Silber Pro Cycling for the first five stages, with Kevin Field, Road Program Manager at Cycling Canada, taking over for the final two stages. 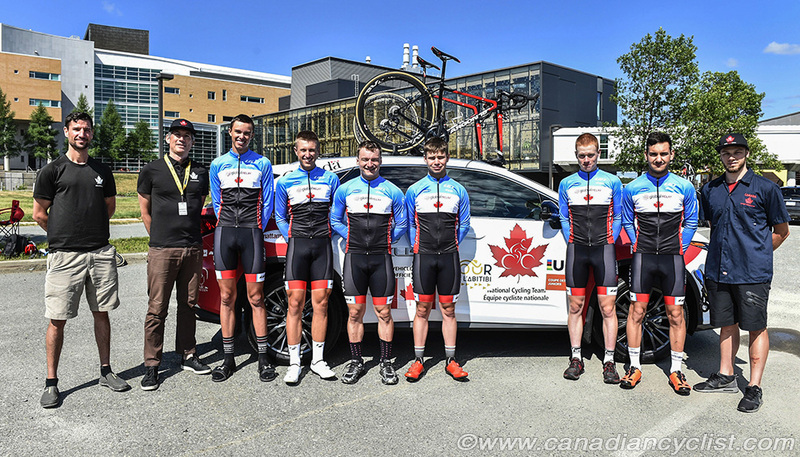 "Winning three stages and the Points Classification highlighted a very successful Tour de l'Abitibi for Team Canada," said McFarlane, who was attending Abitibi for the first time. "We also captured 46 valuable NC [Nations Cup] points. Riley really proved he has the class to win at the international level on the road after dominating the sprints throughout the race." "In terms of the overall, Carson Miles was tracking for a top five in the ITT [Stage 3 individual time trial], when an unfortunate crash took him out of the GC. Better time trial preparation and execution will raise Team Canada's competition level in this race, andmore top ten GC options. Having 3-4 riders in the top ten in GC after the ITT is very doable with the talent in this country. Overall, I had a blast working with the riders and Cycling Canada." Kevin Field stated, "It was really special for us to be here for the historic 50th edition and also to see the fourth rider ever win the race twice; congrats to Team USA and Riley Sheehan; a fantastic performance." "For us [Team Canada], we met or exceeded all of our performance objectives. All our athletes have heaps of potential - and we look forward to seeing where their journeys in Cycling take them - they have so many options. I just hope we can bring Riley back next year to see if he can top his debutant performance!" "Most importantly, this is a pivotal race in the development of all our athletes. Having a team with three first year athletes bodes well for our future. And seeing the commitment our guys brought to riding as a TEAM was really important." "Finally, I want to say a thank you as well to Scott McFarlane from Team Silber; who stepped in to help lead the majority of the project. Seeing the collaboration that staff from our top road teams are bringing to assisting us in development projects is special and really important."